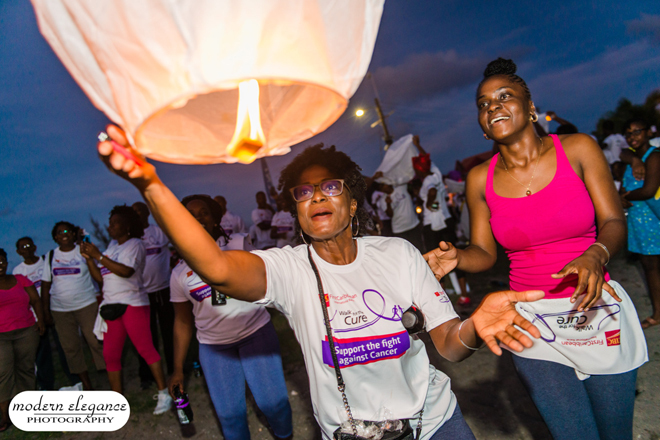 Basseterre, 27th November 2017 – On Sunday November 5th 2017 hundreds of cancer crusaders took to the streets of Basseterre in support of the sixth annual cancer care and awareness event – “Walk for the Cure” hosted by CIBC FirstCaribbean. A picturesque crimson sky provided the backdrop for the route, which took participants from the main branch at the Circus unto the Bay Road, along Frigate Bay Road and culminating at Frigate Bay Beach with the symbolic release of floating lanterns into the night sky. Corporate partners and contributors for this year’s walk included: Royal Beach Casino, Mitcham & Benjamin, Rams Trading Ltd., Kajola Kristada, Tata, Flow/BTC.Visa, SKN Vibes, SeaMoss Taxi Service, Liat, S L Horsford, TDC Ltd, Delta Petroleum; Christopher Harbour, Koscab. The walk is held to coincide with the Canadian Breast Cancer Foundation’s CIBC Run for the Cure sponsored by the bank’s parent company, CIBC. CIBC has been supporting this event for 21 years, donating millions to breast cancer research.